last time I bored you to death, I tried to find those stats that correlate well with winning a game on offense. Today, I will take a look at defense and check what in general correlates best with winning a game (because to win a game, you have to usually play both defense and offense). As all the groundwork got laid out in my last post, I will directly start with the goodies. Opponent FG Percentage at the rim above all: SportsVU data and nba.com/stats gives you the information how well an opponent shoots at the rim while you are in the vicinity. 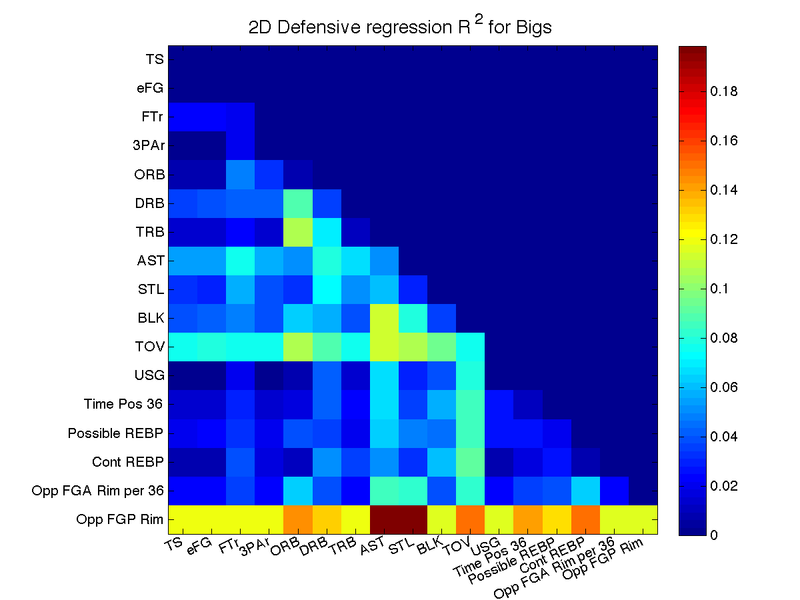 And especially for Bigs that seems to be the one stat that is somewhat informative (R2 slightly above 0.1). 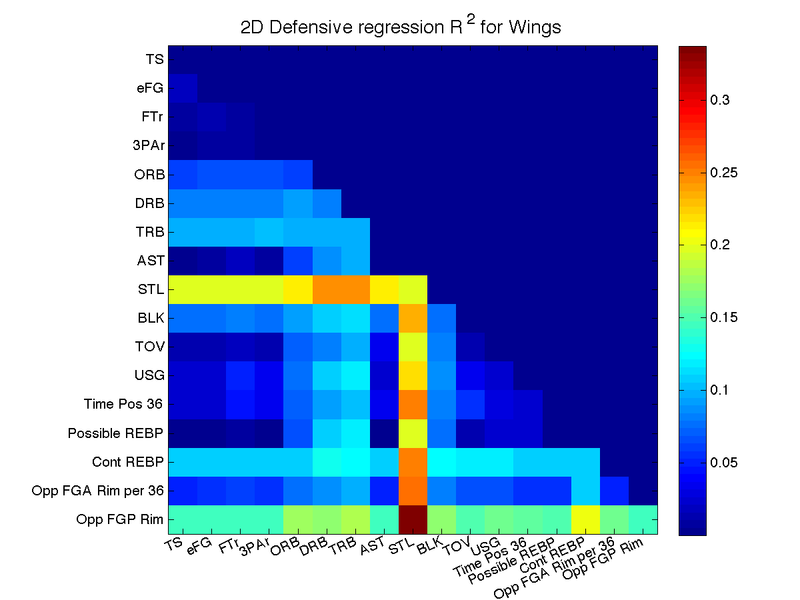 Generally, it seems that we can get the most information for Wings, were other than Opponent FG%, Steals Rebounds and contested rebound percentage gives us an information. And the combination of steals and Opponent FG% alone gives already an R2 above 0.3. There are others that came to similar conclusions about Wings. For Point Guards, other than the steals Opponent combo (which could be something out of Street Fighter II), we have also the funky combination of Opponent FGA at the rim and Time of ball possession that are 'informative'. But in my opinion, this shows you the problem with multiple linear regression and only a few data points: You start to find random combinations that explain your data. 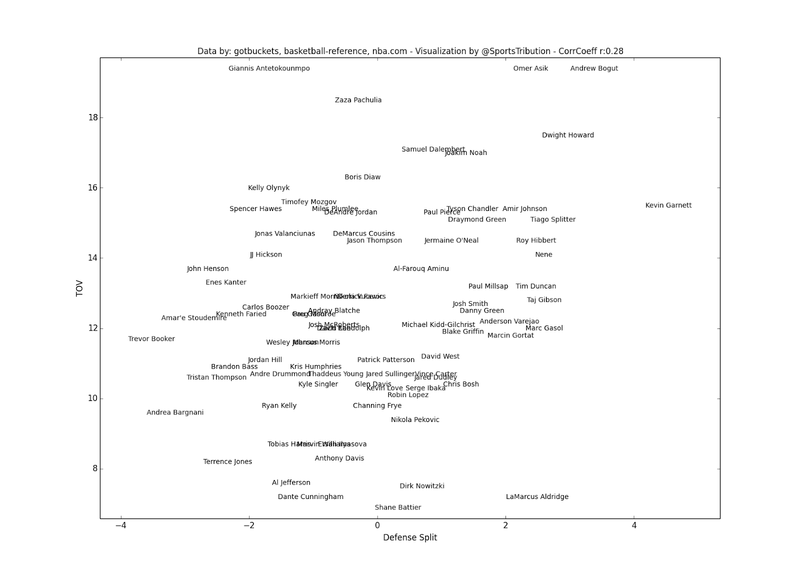 It is similar with assists and Opponent FG% for center. 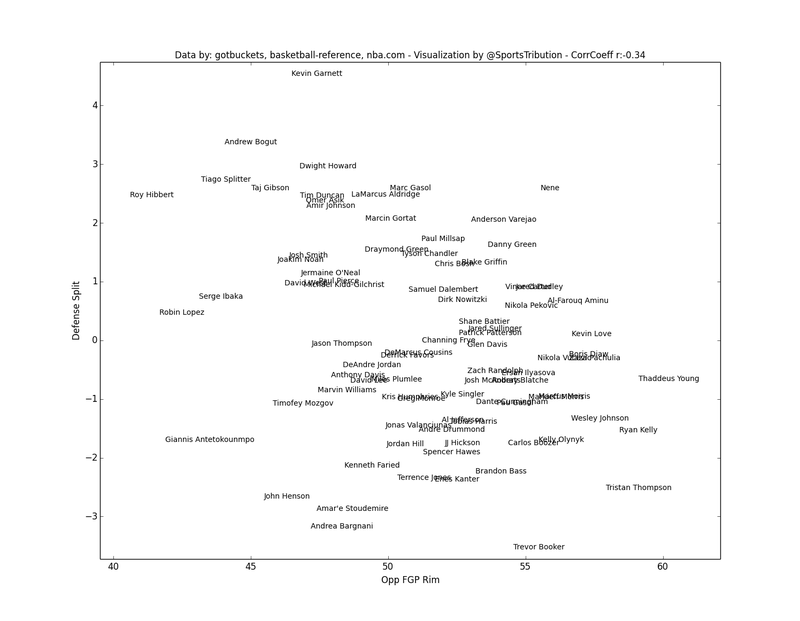 Andrea Bargnani and Amar'e Stoudemire are very bad in Defensive splits (very surprising, I know). But their opponent FG% is only slightly below average. As their assist percentage is also very low, it is the perfect combination to explain their data. More on how to fix this in one of the next 'chapters'.